The Carolinas Campaign began on February 1, 1865, when Union Gen. William T. Sherman led his army north from Savannah, Georgia, after the “March to the Sea.” Sherman's objective was to join Gen. Ulysses S. Grant in Virginia to crush Gen. Robert E. Lee's Army of Northern Virginia. Scattered Confederate forces consolidated in North Carolina, the Confederacy's logistical lifeline, where Sherman defeated Gen. Joseph E. Johnston's last-ditch attack at Bentonville. After Sherman was reinforced at Goldsboro late in March, Johnston saw the futility of further resistance and surrendered on April 26, essentially ending the Civil War. "Ghost Tower" in background, with U.S. 401 beyond tower in road cut. building into piles of rubble and then burn and blow up the ruins.” Poe assigned the duty to the 1st Michigan Engineers and Mechanics. The engineers began their task on March 12, first attacking the machinery with sledgehammers and axes to render it into scrap. Poe wrote that “the clang of hammers & axes wielded by more than a thousand men, is almost enough to drive one crazy.” Then the engineers battered down the arsenal's brick walls using railroad irons suspended from wooden tripods with chains. 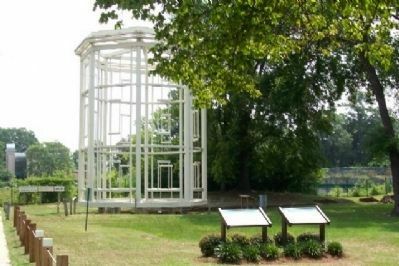 Finally, on March 14, the piles of rubble and lumber were set ablaze as Sherman moved his headquarters across the Cape Fear River. 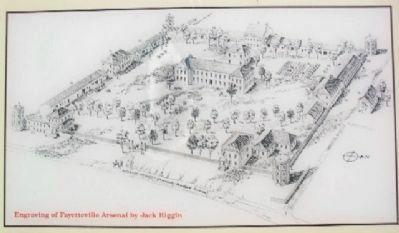 The arsenal grounds stood vacant until 1873 when the government auctioned the land. to the Confederate war effort, however, was the more than 900,000 rounds of small arms ammunition, signal rockets, and friction primers assembled by women workers. Location. 35° 3.279′ N, 78° 53.678′ W. Marker is in Fayetteville, North Carolina, in Cumberland County. Marker is on Arsenal Avenue, on the right when traveling west. Touch for map. Marker is in Arsenal Park, about 30 feet west of the "Ghost Tower," which abuts the Martin Luther King, Jr. Freeway (U.S. 401) to the east. Marker is in this post office area: Fayetteville NC 28305, United States of America. Touch for directions. Other nearby markers. At least 8 other markers are within walking distance of this marker. North Carolina (here, next to this marker); The "Ghost" Tower (within shouting distance of this marker); Forging and Casting [and] Smith's Shops (1839 - 1842) (within shouting distance of this marker); Engine House (1838 - 1848) (about 300 feet away, measured in a direct line); North Carolina Arsenal (about 300 feet away); Arsenal Park (about 400 feet away); Arsenal Stones (about 400 feet away); Gun Carriage and Turning Shop (1842 - 1849) (about 400 feet away). 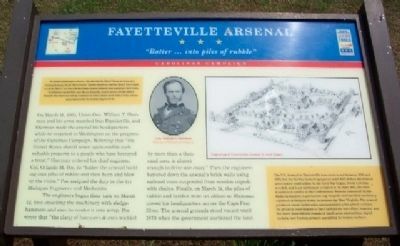 Touch for a list and map of all markers in Fayetteville. More. Search the internet for Fayetteville Arsenal. Credits. This page was last revised on June 16, 2016. This page originally submitted on November 10, 2009, by William Fischer, Jr. of Scranton, Pennsylvania. This page has been viewed 1,995 times since then and 8 times this year. Photos: 1, 2, 3. submitted on November 10, 2009, by William Fischer, Jr. of Scranton, Pennsylvania.